It is millions over budget and delayed for years but the Winnipeg police are preparing to begin the big move to a new building on Tuesday. It's almost two years overdue and millions over budget, but the Winnipeg police will finally move in to the new headquarters in the old Canada Post building on Graham Avenue Tuesday. The police service was supposed to move from the crumbling Public Safety Building on Princess Street in January 2014, but many delays pushed that back. The project is also $75 million over budget. Reporters were given a tour of parts of the building Monday in advance of the first wave of new occupants; the quartermaster unit will be the first group to start hauling their gear into the building. There are still tradespeople running wires and finishing off various jobs related to life safety and security features for the building, but much of 630,000 square-foot facility is complete. When all the staff have made the move (estimated by next July), 1,200 people will work in the building. The $214-million headquarters has a brand new communication centre that will include the 911 call operators, fitness facilities for officers that feature work-out equipment and basketball courts and a central processing unit for suspects and witnesses. 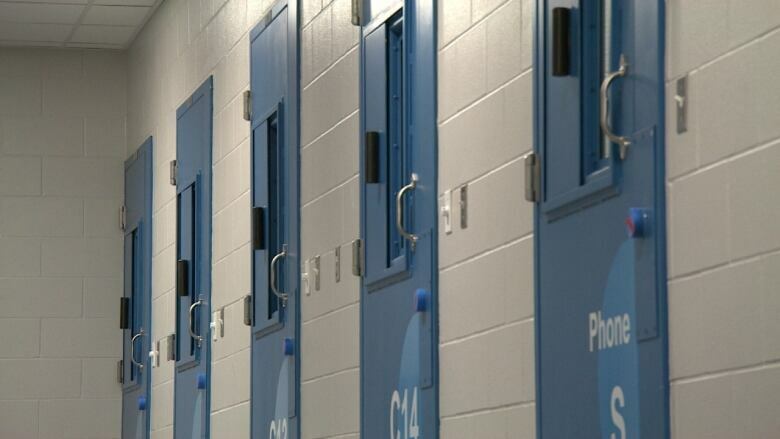 The Winnipeg Police Service believes the expanded facilities to process and interview prisoners will speed up turnaround times and get officers back on patrol. "We are expecting that turnover to be so much quicker where members of the central processing unit will take that prisoner over. We'll have officers back on the street that much quicker," Const. Jason Michalyshen told reporters. It's hard to tell the new headquarters was once a mail-sorting facility. There are high ceilings, the colours are vibrant and there is light coming in from many windows. "Lots of light! It's just a brighter atmosphere and just a much nicer work environment than what we are used to, for sure," said Michalyshen. The remodeled building also houses a lobby for the public to access police services and the Police Museum, featuring equipment, uniforms and memorabilia from decades of policing Winnipeg streets. The police believe there are a number of efficiencies they will get from the new HQ. "We are taking, I believe, nine buildings from outside of the downtown area, taking our staff from those buildings and bringing them down here. So just the efficiencies of not having to drive to the districts, to the other areas," Supt. Bruce Ormiston said. The police service also lauds the close proximity of the Law Courts building and the Remand Centre as possible time-savers. "The best analogy I can give is it's one-and-a-half times the size of Ikea and our current Public Safety Building will fit on one floor of this building," Ormiston told reporters. Ormiston says the advantages of the new HQ over the old Public Saftey Building are numerous. "We are leaving a building that was originally built in 1966, coming to a building that was, although built prior to '66, really new for us. The facilities here are wonderful, good for our employees and we are excited to be downtown and part of the community here." said Ormiston. Ormiston admitted it was a relief to start moving past some of the controversy and delays in taking over the building. "I think it is. Certainly the public has wondered what caused the delays; our members have as well, and we are excited. I can't say enough, we are excited to be in this building and on schedule." Ormiston wouldn't comment on an ongoing RCMP investigation into the construction of the building and a very public raid on the offices of Caspian Construction, the general contractor that did most of the renovations. Ormiston said he didn't believe it would taint the move-in or occupancy of the new facility. The renovations are more than $75 million over original estimates. Police belive they are now on budget for the rest of the final costs associated with construction, equipment and moving costs. A decision on exterior security features which may included concrete barriers or bollards has not been made yet.